Written by Scott Joseph on 31 August 2017 on 31 August 2017 . Victoria & Albert's has been voted Best Fine Dining in Scott Joseph's Foodster Awards for Independent Restaurants. Bull & Bear at the Waldorf Astoria was your second favorite and Norman's at the Ritz-Carlton was third. Good choices, all. Each could be considered the epitome of fine dining, with luxurious tablecloths, a relaxed atmosphere, slow pace, impeccable service and, of course, exquisite food. The Bull & Bear at Orlando's Waldorf Astoria is an offshoot of the original in New York. They are the only two B&B's, so it qualified as an independent restaurant for our purposes. (Foodster Awards are open to restaurants with three or fewer locations.) Chef de cuisine Richard Brown takes the Orlando menu beyond the steakhouse mien of the Manhattan original. General manager Rafael Frederick leads the dining room staff. There are fewer fine dining restaurants these days, not only here but also in places like New York and Chicago. Like so many other things in culture, the definition of fine dining and special occasion restaurants is being rewritten by a younger crowd. But one hopes there will always be restaurants like these for the times when we feel like being extravagant. The restaurants listed here have been nominated for Best Fine Dining. So what constitutes fine dining? It's a higher level of fod quality along with an elevated style of service. Tablecloths are usually employed, and quiet conversation is possible. Good wines are available, often with a sommelier to make recommendations. You know a fine dining restaurant when you're eating in one! These nominees fit the bill. Voting is open through Oct. 4. The winner will be announced in the Oct. 5 edition of the e-letter. Place your vote by clicking the box next to your choice and then clicking the Vote button. Only one vote per person is allowed -- if you've already voted, the Vote button will not appear. 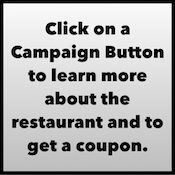 You may write in the name of a restaurant that you'd like to nominate. But remember: The Foodster Awards are exclusively for independent businesses, defined as having three or fewer locations -- no chains. Any write-in nominees that don't meet that definition will be removed from the list. Also, do not write in the name of a restaurant that is already named in the list -- by doing so you may actually reduce the number of votes that restaurant might receive because only the votes on the first listing will be counted.